The merger of ambulance organisations in the South East will not lead to any adverse effects on patient services, it has been promised. 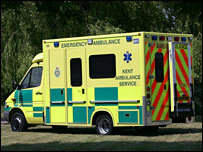 The Kent, Surrey and Sussex ambulance trusts are being joined together to form a new South East Coast Ambulance Service NHS Trust from 1 July. The move will see benefits for patients in the future, a spokesman said. A reorganisation of health services in the region is also seeing 24 primary care trusts (PCTs) being cut to eight. The strategic health authorities (SHAs) for Surrey and Sussex and Kent and Medway will become a single body covering the South East Coast region. Paul Sutton, chief executive of the current Sussex Ambulance Service and the leader of the transitional process towards one combined trust, said: "The merger is not about reducing frontline resources, nor will it affect the excellent services already provided by the three existing trusts." A spokesperson for the Unison union said it had raised concerns about the cost-effectiveness of the ambulance merger, but that its members were now working with the trusts to provide a service offering the best possible patient care. The eight new PCTs are due to come into effect on 1 October. The trusts are at the centre of the local NHS and are responsible for the provision of all healthcare within their areas, from hospitals and walk-in centres to dentists and opticians to mental health services. Fifteen PCTs are being reduced to five in Surrey and Sussex, covering a population of more than 2.5m people. Around 1.6m people in Kent will be served by three trusts which are being formed out of nine current ones across the county. The bosses of the new trusts will be announced during the summer, but £21m savings are being estimated through reduced management and administration costs. There will be "fewer jobs once the reorganisation is complete". Speaking for the new combined SHA, a spokeswoman said: "We do not have any clear idea of numbers at this stage. "Redundancies are not ruled out but there has been a vacancy freeze in operation since last year and every effort will be made to help displaced staff find other jobs." Candy Morris, the proposed chief executive for the new South East Coast SHA, said the changes would "enable the local NHS to better design and deliver improvements in the health and healthcare of local people".